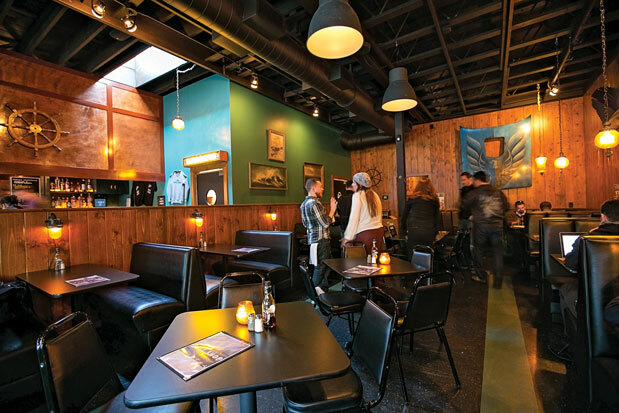 Nestled in the calm northern curve of Broadway on Capitol Hill, Bait Shop conjures a cozy lakeside lounge in the 1970s Midwest, a spot where you might grab a beer—and worms for fishing—but this update has far better offerings. From the old beer signs to the stuffed marlin adorning the wood paneling—and even a Bermuda blue Firebird hood mounted on the wall—Capitol Hill impresario and cultural curator Linda Derschang (Oddfellows, Linda’s, Smith) has given Bait Shop a definable feel, but one that never comes across as forced, just comfortable. The cocktail menu includes mainstays such as the zombie ($9) and the mai tai ($8) making appearances alongside a few twists on classics, such as a coconut lime rickey ($7). However—and normally being anti blended drinks, I almost can’t admit this—the top drinks are dispensed from giant, square blending machines, like the ones you’d have seen in bars and convenience stores in the ’70s. My favorite is the Painkiller ($9), mingling rum, pineapple, coconut and orange juice, with a bit of nutmeg on top, into a chilly tropical treat. Cocktails on tap are also available, including a lush and rummy Dark & Stormy ($8), made with Rachel’s ginger beer. The cocktails aren’t the only pleasant period pieces. The food menu features such standouts as puffy, crispy handmade barbecue pork rinds ($4), lightly batter-dipped fish and chips ($12), and the best fried mushrooms I’ve ever snacked on ($6). Instead of bland buttons bursting with grease, this delicately breaded delight features enoki, oyster and other more exotic mushrooms. With Bait Shop’s modern takes on legendary lounge eats, drinks served up by friendly staff and timeless hits, it’s easy to forget what year it is—which is exactly the effect a good bar should have.